Capoeira is a unique and original art form born in Brazil. This dance-based Capoeira is a unique and original art form born in Brazil. This dance-based martial art developed from a variety of influences, including native West African dances. Capoeira was used by African slaves to help them maintain and develop their own cultural identity and to fight oppression. Capoeira is a game, a dance, and a fight, governed by the ruthless rhythm of the berimbau, a native African musical instrument. Capoeira developed all over Brazil, in the states of Bahia, Rio de Janeiro and Pernambuco, surviving attempts to stamp out its practice. 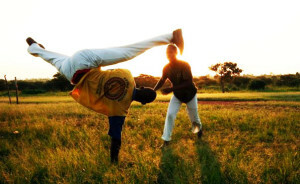 Traditional capoeira masters such as Mestre Pastinha (Capoeira Angola) and Mestre Bimba (Capoeira Regional) made important contributions to the art, developing more standardised styles; Angola and Regional. The Senzala Group reached Uganda in 2005, and It was then introduced at sharing Youth Centre Nsambya in 2009 by a Brazilian called Professor Piriquito Under the guidance of Kurtstone(Uganda) and Hedson Joet(Uganda).